Sequin beaded belly dance costume belt with butterfly design, multi-color faux gems, and fringe - great for any style belly dance. Velcro closure. 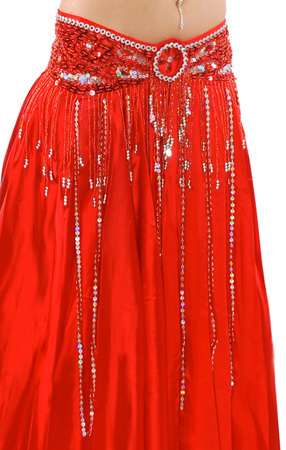 This sequin beaded belly dance costume belt with butterfly design, multi-color faux gems, and beaded fringe is great for Egyptian and Cabaret style belly dance. Get double security with the adjustable hook-and-eye system plus adjustable Velcro closure. 3 sections of Velcro to adjust sizing up or down. S/M U.S. Women's Size 4 - 8. Top edge of belt 33 - 35 inches (leaves approximately .5 inch overlap at max). M/L U.S. Women's Size 8 - 12. Top edge of belt 35 - 37 inches (leaves approximately 1 inch overlap at max). L/XL U.S. Women's Size 12 - 14. Top edge of belt 38 - 40 inches (leaves approximately 1 inch overlap at max). This red fringe belt is beautiful and I love it. I got one in gold as well and it is equally as beautiful.